This diagram shows how scientists determined the size of the halo of the Andromeda galaxy. 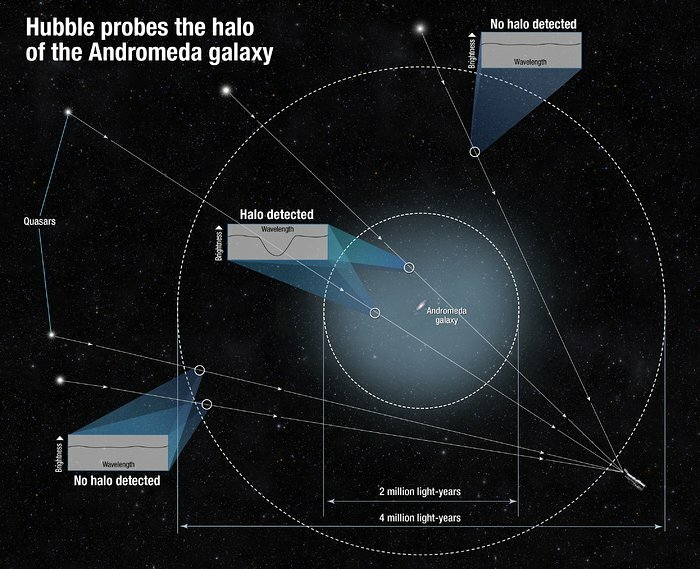 Because the gas in the halo is dark, the team measured it by using the light from quasars, the very distant bright cores of active galaxies powered by black holes. They observed the quasars’ light as it traveled through the intervening gas. The halo’s gas absorbed some of that light and made the quasar appear darker in a very small wavelength range. By measuring the tiny dip in brightness at that specific range, scientists could tell how much gas is between us and each quasar. Some quasars showed no dip in brightness, and this helped define the size of the halo.